Mars Palm Beach Estate Holdings. 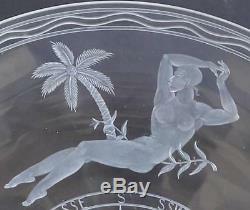 Important Steuben Glass'Mariners' Bowl-Sidney Waugh, Dated 1937 signed. American Glass created in 1937 in Corning New York by Steuben, the finest quality glass objects ever fabricated! 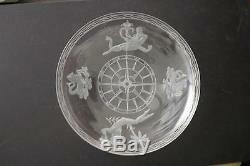 Own an inspired museum American glass piece'Mariners Bowl' very rare extraordinary large signed and dated 1937 Steuben mythical carved Intaglio decorated with a central design of a compass, framed at each cardinal point with an allegorical figure and trimmed with a decorative band around the rim. A decorative Tour de Force! Designed by Sidney Biehler Waugh signed incised on the underside of the rim-Steuben dated-1937 in excellent condition. A Steuben'Mariners Bowl' designed by Sidney Biehler Waugh with finely engraved intaglio decoration featuring Neptune, Queen Casseopeia, and two mythical creatures-the Hippocampus-a horse with fish tale and wings. The center of the bowl is finished with an intaglio carved compass rose. An example of this piece is in the permanent collection of both the Brooklyn Museum and the Virginia Museum of Fine Arts. 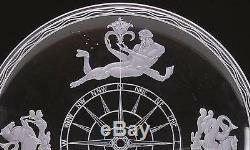 Under bowl is engraved and frosted with four figures- figure of Poseidon Greek God of the Sea and namesake of the celestial planet. He is holding a stylized cornucopia trident pointing North. Opposite Neptune to the South is a figure of Queen Cassiopeia namesake of the celestial constellation and mother of Andromeda in Greek mythology. 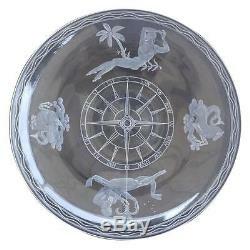 The East and West positions on the compass are occupied with a carved and frosted figure of a stylized Hippocampus- winged Sea Horses- Poseidons sidekicks, engraved and frosted double line circular rim borders encompassing an undulating double wave line motif. 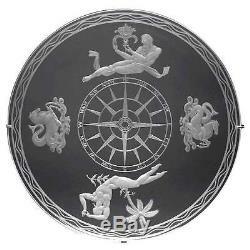 An eight pointed star occupies the bowl center of an etched celestial compass design with six radiating circles and sixteen triangular rays terminating at letters signifying sixteen directive points of the compass. Also shown in photos the bowl can be mounted on a stand to display decoratively (ours has no stand). CREATOR Steuben Glass (Maker) OF THE PERIOD American Modern PLACE OF ORIGIN United States DATE OF MANUFACTURE 1937 PERIOD Early 20th Century MATERIALS AND TECHNIQUES EngravedGlass, Frosted, Hand-Crafted CONDITION Excellent. No visible scratches or scuffs. H 7 cmH DIAMETER 16 in. (41 cm) DEALER LOCATION West Palm Beach, FL NUMBER OF ITEMS 1. Our private 4 generation family world-wide holdings, amassed from a history of passionate collectors, from love of the hunt and appreciation of beauty-dreamers, industrialists, architects, philanthropists, designers, artists. Our collection includes a vast assemblage-diverse in scope, uncommon in nature-ranging from 16th thru 21st centuries-with venerable provenance- a King of Spain, a noted Fashionista, a Scion of Industry, American Society Heiress, African Princess, Royal Countess. The Doyenne of our establishment is Mars. Her experience and expertise in Art, Antiques, Designs 4 decades as a partner, together with her illustrious husband, Ronn in interior architecture firm Ronn Jaffe, inc. Notable clients include the White House, Aristotle Onassis, the Sultan of Brunei, Countess de Quatro, and many Fortune 100 Corps. Also, Jaffe's custom furniture, jewelry, and art is much sought after today. Antiques and Vintage furnishings provide an appreciation of our roots and history. I encourage my clients to'Keep the Story Alive'-passing on its continued heritage thru adding their own story in the mix. Also, we represent several design artists- the energy of contemporary furnishings and art impress our moment's culture. We continue to seek out the special and share the Magic! Our terms and conditions are to assure that there is mutual respect and understanding between all parties. We confirm that we either own the Work or are authorized to sell it on behalf of the owner. If you wish to rely on any variation of, or addition to, these terms and conditions, you must ensure that any such variation or addition has been agreed in writing by Mars PB. Any and all statements by us as to the authenticity, attribution, description, date, age, provenance, title, or condition of the work constitute our judgment and opinion only and are not warranted by MPBl. We do not accept any liability as a result of any changes in expert opinion by MPB or any third party which may take place subsequent to the sale. This paragraph, however, shall not operate so as to exclude any liability on MPB's part for any fraudulent misrepresentation concerning the work. 2.2 MPB cannot warrant and is not authorized to certify UL Laboratory compliance for any item. 2.3 While we will on request explain the condition of the work, at the time of the sale and provide any information about condition for which you may reasonably ask, we will not be responsible for any subsequent deterioration of the work, however occasioned, after the sale. 2.4 You are responsible for satisfying yourself as to statements made by us as to the matters set out in paragraphs 2.1, 2.2 and 2.3 above. 4.2 From the time and date of agreed collection of the work from MPB, you will be responsible for the work and the risk of loss or damage shall pass to you. Possession of the work work; 5. MISCELLANEOUS 7.1 These terms and conditions binds & inures to the benefit of the parties' assigns, successors, trustees, heirs, executors & administrators. Any proceedings or arbitrations arising hereunder shall be prosecuted in or before a court, panel or other adjudicatory body located in the County of Palm beach. 7.4 The invalidity of any portion of these terms and conditions shall not effect the remainder of these terms and conditions. You may also be interested in.. The item "Important Steuben Glass'Mariners' Bowl-Sidney Waugh, Dated 1937 signed" is in sale since Wednesday, July 12, 2017. This item is in the category "Pottery & Glass\Glass\Art Glass\North American\Steuben". The seller is "marspb" and is located in West Palm Beach, Florida.